Thursday that week I had both of my ladies with me again, and a repeat visit to Moonee Reserve was demanded by all since it was such a HOT day! Taken on October 15, 2009. Surveying my nieces in the water before joining in myself. Once upon a time I used to be a lifeguard, I was also slim and trim back then! It was way too hot to just watch though..
Splashing around is much more fun! Just ask the girls! Clever eyes though! 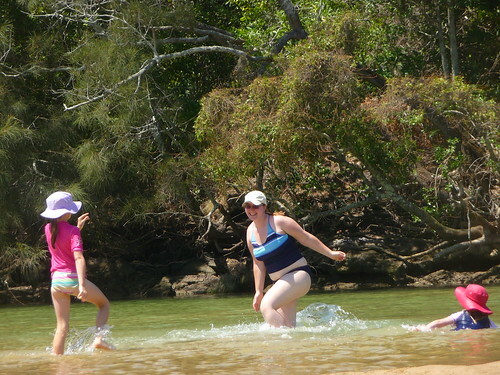 That is a stripes singlet in the centre shot; I took it off before hopping into the water. Go you! A visit to the beach can be wonderful and revitalizing; soaking in all that sunshine! *hugs* make it happen!